Without a doubt, the makers of York peppermint patties have hit upon a winning combination of flavor and oral sensation--that rush of cool on one's tongue after having bitten into one of the little pucks is unique and absolutely delightful (particularly for lovers of the chocolate and mint pairing, as I most obviously am). Have you ever had one straight from the freezer? D. Vine. Now, what if you could have that same chilling tingle in an even more fluffy fashion and in much larger portions? Win-win. This pie is so simple--it consists of melted peppermint patties folded into airy and creamy whipped topping and piled atop a chocolate cookie crust. It's so luxurious and refreshing, folks; I can't find enough proper words to describe it. If I had to pick one negative characteristic of the pie, it'd be that it melts pretty rapidly once it's out of the freezer. Fortunately, it's so darn tasty, one needn't worry about not being able to eat it before it disintegrates into a pool of (undoubtedly delicious) goo. Heat oven to 350°F. Stir together cookie crumbs and sugar in medium bowl. Blend in butter, mixing well. Press crumb mixture evenly on bottom and up sides of 9-inch pie plate. Bake 8 minutes; cool completely. Remove wrappers from peppermint patties; cut into pieces. Place candy and milk in a microwave-safe bowl and nuke at 30-second intervals until the patties melt. Fold into the thawed whipped topping and plop into the prepared crust. Freeze at least one hour to set. Wow! This sounds so easy and refreshing. Think I will make several for the Labor Day crowd. Glad I stopped by. Have you been reading my mind?! I've been dreaming about pie for days, but haven't attempted any due to a lack of desire of spending all afternoon in the kitchen. Ahem, problem solved! Las fotos que haces son espectaculares, se ve tan cremoso y rico este pastel. Me encanta. mamamiya..this looks scrumptious! Love its ice-cream like texture! Aw, I wish I could get my hands on some York patties in France...this looks SO amazingly good!!!! Refreshing X 1,000. This looks delicious. I'm a huge fan of frozen, minty desserts. 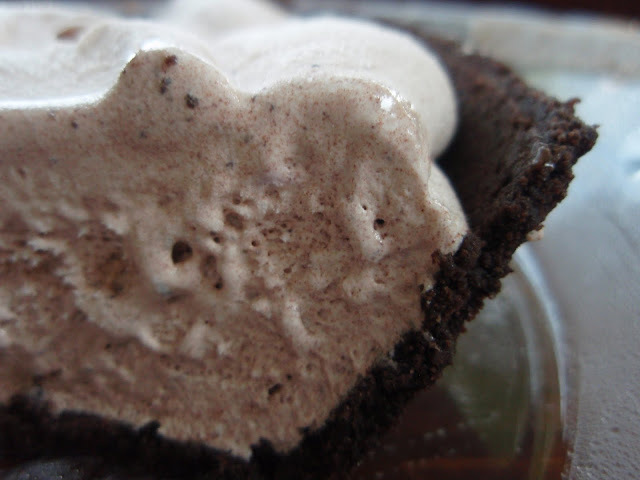 Peppermint patties in pie form is something I would love to try! It looks super creamy and delicious! I'd day perfect and pleasing are good words to describe this sweet treat. i have been eating those mini york patties frozen pretty much all summer. never put them in a pie, but don't think i should as this looks way too good. i know i would eat a lot of it. if you ever get the chance, try those dark mint cups by Newman's Own...amazing. they have a bit more chocolate than York and a tastier chocolate too. Love the alliteration in the recipe title! My girls would love this! Ooooh. My kiddos and I would be all over this. In fact, I finally picked up The Perfect Scoop and we decided to make peppermint patties for peppermint patty ice cream first. I'm bookmarking this one though. I totally see it in my future. Yum! Larger portions of minty cold goodness? Count me in...yum! Grace, you are my hero. That is all! 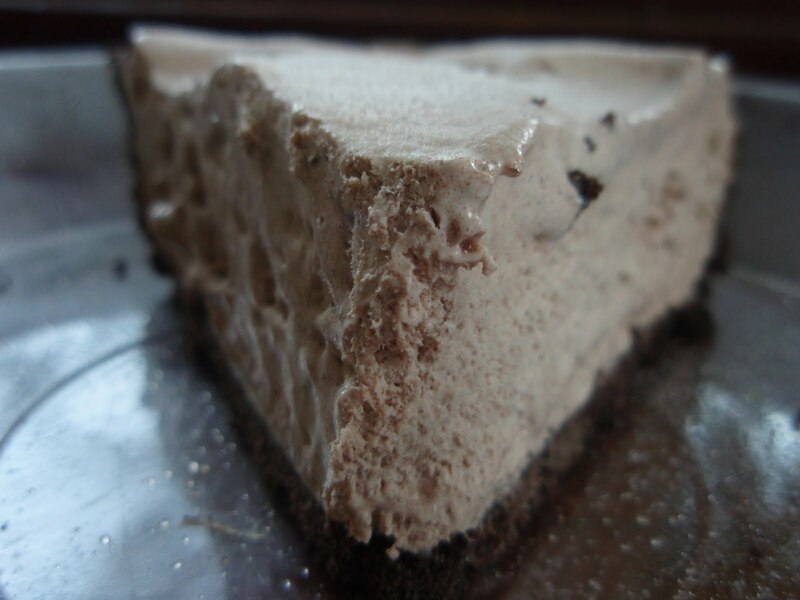 Oh, my goodness, this peppermint patty pie sure looks heavenly! Must try very soon! I looooooooove peppermint patties. (Frozen or not, they're my favorite candy bar.) This pie looks scrumptious! I am such a fan of Peppermint Patties!! I have to try this. Thank you! You have no idea how bad I want to eat this right now!!! Absolutely love york peppermint patties. Especially when they are fresh and so soft in the center. Your pie looks amazing! A must try! This looks amazing! I can't believe how simple it sounds to make. It looks super creamy and fluffy! Gorgeous pie! And this is coming from someone who is not so fond of the mint/chocolate combo. I would eat this in a heartbeat! I jsut love peppermint patties. No doubt I would love this pie. Mint always wins me over. Mmm I do so love the chocolate mint combination as well. You really hit it out of the park with this one, Grace :). Oh my, this looks incredible. Mint and oreo? Yes, please. It looks so fluffy and creamy! oh my, I can't put into words how perfect this looks and sounds, have to try it soon! love peppermint patties!! and in pie form?! awesome! Candy bars from the freezer was my favorite thing ever at summer concession stands back in the day. Obviously, I need this pie in my freezer. Sounds fantastic! Oh yeah, Matt would love this! I love love this minty creation...oh heaven!! My mint/chocolate loving husband and kids would be thrilled if I made this for them. You described the taste of a peppermint pattie perfectly! And the pie looks D-vine! Seeing as how mint chocolate chip ice cream is a favorite of mine, I'm sure I would adore this. You always have the best ideas when it comes to such things as candy-inspired cakes. Grace...the pictures are a torture...so close and yet so far...would love to taste this pie...love the peppermint patties in the pie...to tempting! This sounds absolutely delicious! I'm a big fan of chocolate and mint as well so this is right up my alley. Thanks for sharing! (Clapping hands like moron and bouncing) Pie Pie Pie Pie! I knew I'd gain a few pounds visiting you today! Wanted to say hi. This looks amazing, as usual! Um, I need this pie. Now. No joke. In fact, I'm done commenting because I have to go back and look at the photos. gorgeous! what a great idea for a pie!! I will have to add this to my dessert list for my girls....they will love it! oh wow, this is one of my favorite combinations! i love it! I love chocolate and mint together-this is a winner Grace! I don't think it will last long at our house. Thanks for highlighting such a combo which I usually don't think about. EEEYIKES! Does that ever look wonderful. I'll have to wait until I go to my daughter's to make this-my other half doesn't like mint so I'd have to eat the whole pie myself......gee, what a problem huh? I could see this going down quite nicely too. How fabulously easy is that? And melted mint patties? genious! This surely wouldn't last long - in our out of my freezer. And ps, thank you for the birthday wishes! That sounds simple, easy and absolutely fantastic. Chocolate and mint is so yummy! And this seems so easy to make. Can't wait to try it at my next BBQ! wow, even better cold huh! Like you say D Vine! I can't wait to read up more on Harold McGee's book! Sounds super interesting! This is so easy it ought to be outlawed. These flavors together are why I put chocolate frosting with peppermint extract in it on top of yellow cake, and call it Peppermint Patty cake. There's never any left. And your book looks like such fun! Feed us more excerpts! This is such a tease and it makes me so sad that I don't have a piece of that pie to eat. I knew when I read the title of this post that I was going to like what was coming! This sounds refreshing and D. Licious, definitely saving. Grace, this is perfect for a sizzling day. yum! looks cool, creamy, and delicious! This looks like such a refreshing dessert! Looks delicious! One of my favorite combos is peppermint and chocolate. I was actually thinking about making a recipe with that combo lat night. This looks like one I will def. have to try out! Cool idea! Sounds like a crowd pleaser. Catching up on some blog reading and thank goodness I did!!!! I would have hated to miss this! I LOVE peppermint patties straight from the freezer - so this is perfect for me!! Oh yum. This is so up my alley. I have to make this for my husband, he'd go crazy. Should it work as well with real whipped cream? What a perfect summer treat! Must be so light and minty and refreshing.